We have always believed in the power of the creative arts to transform lives and relationships, bringing old and young together, to share and learn from each other. Dementia is a condition which has often been misunderstood by society or brushed under the carpet. We believe it is good to raise awareness of issues affecting older people in local children so that they can grow to be adults with empathy and understanding. In continuing our intergenerational work, we wanted to develop a project that was thought-provoking yet touching – one that would help the children understand more about conditions like Dementia, to foster a sense of compassion and empathy. 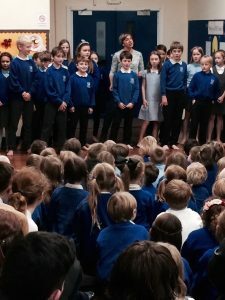 In the Summer of 2017 we set up a number of meetings with local primary schools and forged a good working relationship with the Headteacher and staff at Hebden Royd Primary. They were keen to develop intergenerational links within the community. It was decided to deliver a piece of work to support the school’s Year 5 children on the subject of ageing and dementia – using the creative theme of ‘Dreams’. Our arts worker Natalie Speake, who delivers verd de gris’ weekly creative dementia sessions, worked with us to shape an intergenerational exchange project that would explore the theme of ‘Dreams’ with the children and the older people. Natalie introduced the theme of the project into her work with the weekly creative dementia group – and introduced the possibility of the group meeting and sharing creative activities with the local schoolchildren. At the same time Natalie began delivering a series of creative sessions with Hebden Royd Year 5 children, using illustration, dance, singing and poetry to explore our chosen theme. Natalie then brought the two groups together with the children visiting the creative dementia group which takes place every Tuesday at Hebden Bridge Town Hall. 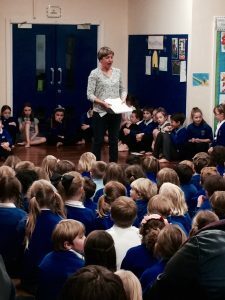 Natalie was invited to share the project outcomes with the Yr 5 group at an emotional Parents Assembly at Hebden Royd in October 2017. “It was a very effective way for children to learn about dementia and Parkinson’s. The different generations coming together was very powerful. It was great that the older people felt part of the whole community. They didn’t feel left out and I felt that everyone benefitted.” MR SMITH, Yr 5 Teacher, Hebden Royd Primary.